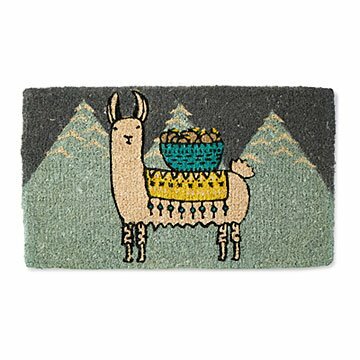 Reward journeys with a greeting from Larry the llama, the star of this colorful, sturdy welcome mat. Reward journeys long and short with a greeting from Larry the llama. Made by Andrea Brown of sturdy 100% coir fiber, this welcome mat paints a colorful Peruvian scene-- the star of this description wearing a blanket and basket of cargo-- that adds a touch of cheer wherever family and friends end their treks. From the Andes or otherwise. Made in India. Textile designer Andrea Brown brings joy to everyday objects. Inspired by travel, color, and the unexpected, her doormats add some fun to function by breathing new life into an object we usually take for granted. Along with her design team that includes a black dog named Luna, she has made British Columbia her home. We needed more Larrys and Llamas in our lives! This Larry has already become an integral part of my brother's family. He brings joy to everyone who enters the home. Additionally Larry the Llama has kept people from bringing their dirt across the threshold. Larry the Llama is a must have for all homes with a front door. Great quality + Boho vibe! Just what I was looking for! I saw this and couldn't resist ! What a fun way to welcome my tribe into my Holistic Studio space! Some reviews said it didnt hold up in the elements. But gorgeous in the hall. I'm Andean. This puts a smile on my face when I get home! It's a cute, thick, and sturdy welcome mat and it was a great price! Larry likes my front porch! It's outside, in a not very sunny spot. Still the wear and what little sun it got made it fade after only a month outside. I love this doormat but as soon as it rained it was ruined. If I would hav known this I woiud have brought it inside or not have bought it. This rug is just as expected - super cute and great quality. I think it will last for some time. Fun design, and it pulled all the colors in the room together.